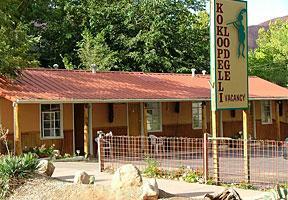 The Kokopelli Lodge is in the heart of Moab. I’ve stayed at this well run motel on two occasions and have been satisfied each time. The location is its prime point: Most motels are located north of town on busy, and noisy, highway 191. The Kokopelli is located at the corner of 100 East and 100 South, just two blocks from the popular bar McStiffs restaurant/microbrewery and the Mondo Cafe, but in a quiet residential area, making your stay in Moab feel more like a home and less like a motel. Best yet the owners are friendly and helpful, and they’ve bike friendly as well with a selection of tools for use after a rocky day on the trails.